A wonderfully rich Chocolate cake that is gooey, rich and delicious. Unique when compared to the other cakes as it has a liquid chocolate inside. 1. Mix the chocolate and butter in a bowl set over a pan of boiling water. 2. Ensure the bottom of the bowl does not touch the water. 3. Heat till the chocolate and butter has melted fully, stirring from time to time. 5. Beat the eggs and egg yolks in a bowl. 6. Halfway through, add the sugar and beat well until the mixture is soft pale yellow and doubled in size. 7. Add the almond flour and beat well until well combined. 8. Add the reserved melted chocolate and beat for a minute. 9. Fill the moulds with the batter and place them in a preheated oven at 425F/220C. 10. Bake for 10 minutes or until the top is almost set. 11. Remove and quickly invert onto serving plates. 12. Sprinkle some icing sugar on top. 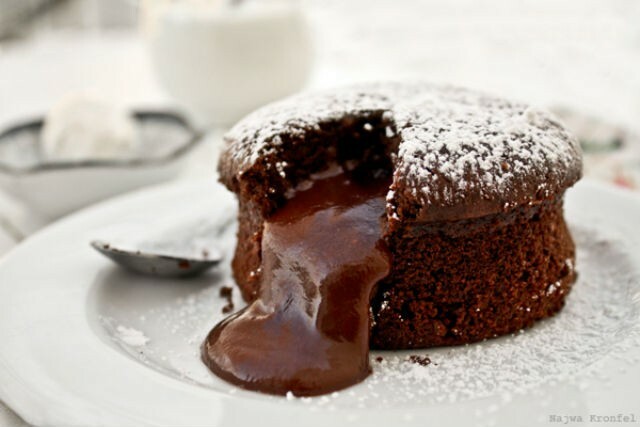 Feel free to comment or share your thoughts on this Molten Chocolate Cake Recipe from Awesome Cuisine.